Have you ever looked at a steel structure, bridge, or building and wondered why it was completely rusted to an orange or brown instead of its original silver? While some may think this is what happens to steel when it’s left in the weather, this actually isn’t the case. Chances are what you saw was actually a special steel often referred to as weathering steel, which has been trademarked as Cor-Ten steel. Cor-Ten was developed to eliminate the need for painting over time. Due to its unique chemical composition, it has an increased resistance to corrosion compared to other steels and forms a rust like barrier when exposed to the elements. It is specially designed to ensure the weathering process only happens on the surface of the steel. The “rusting” will not affect the steels integrity and remains a solid, strong structure for the life of the item. In the meantime it creates a unique, attractive patina that will stand the test of time. Although much of the Cor-Ten steel you’re going to see is on architectural buildings, many outdoor fireplace manufacturers are wisely beginning to utilize this technology. It’s important to note that the natural weathering process of this type of steel could lead to rust stains on nearby surfaces so it would be wise to keep it away from valuable or light colored surfaces until the process is completed, usually within about 3 months depending on humidity. If the rust barrier needs a little smoothing out you can do so by scrubbing lightly with a Scotch Brite pad. 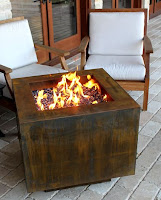 Once the rust barrier weathering process has completed it will leave you with a uniquely weathered fire pit.